It’s cold out there baby. But that just means no crowds and no bugs. Even if it is dark at 4 pm 😉 But it also means you can eat hearty meals – to just stay warm. There isn’t much better than celebrating Thanksgiving, the Winter Solstice, Christmas and New Years Eve in the wilds. Going camping on the Winter Solstice with a warm fire, surrounded by candles, is to me what holidays should be. Snow is the bonus. Heat the oven to 350°. Cut the bread into small crouton shapes and put on a baking sheet. Bake for 30 to 50 minutes, checking every 10 minutes, stirring, till crispy dry. Once cooled, use a rolling pin to break them up even smaller. In a small bowl mix the seasoning blend together until well combined. Split into 3 quart freezer bags (about 2 cups dry bread each) and 3 Tbsp dry seasoning mix. Note on each bag “Add ½ cup near boiling water and 2 Tbsp oil or melted butter”. In camp, after adding the oil and water seal the bag tightly and shake to distribute. Put in a cozy for 15 minutes. Each bag serves 2 to 3 and the recipe makes 3 bags worth. In camp add 1¼ cups near boiling water to the bag. Stir well, getting into the corners. Seal tightly and put in a cozy with the stuffing for 15 minutes. Add the gravy mix to 1 cup water in a small pot, stirring well. Add in the chicken (or drained turkey) and bring to a boil. Lower the heat and let simmer for a few seconds, until nicely thickened. Season to taste with black pepper if desired. 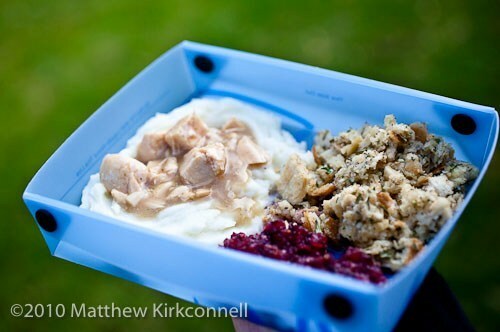 Serve over the mashed potatoes. 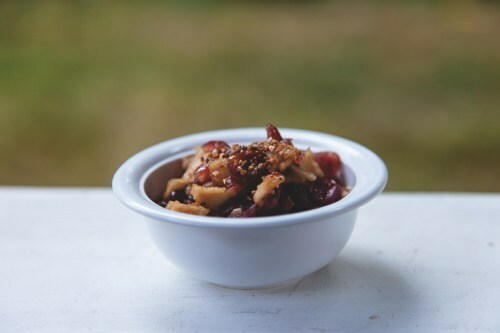 Note: Add ¼ cup dried cranberries or cherries before cooking. Grind the cranberries with the sugar in a food chopper or small food processor. Pack in a pint freezer bag. In camp add ½ cup near boiling water. Seal the bag and put in a cozy for at least 15 minutes. Letting it cool down after rehydrating will help it thicken up. At home pulverize the cranberries and orange peel in a mini food chopper or blender till a small chunky paste (it will be sticky). Pack in a pint freezer bag. On trail add ¼ cup near boiling water. Seal the bag tightly and let sit in a cozy for 15 minutes. Open the green bean package and find the desiccant packet, toss. Add in the dry ingredients and 1¼ cups boiling water. Stir well, seal tightly and let sit for 15 minutes. Open up, stir well and add in ¼ cup of the fried onions, stirring in. Top with the remaining onions. Pack the rice ingredients in a sandwich bag or quart freezer bag, depending on cooking method. Mark “Add 2 1/2 cups water” on bag. Pack the walnuts in a snack bag. Add the chicken, with any broth, water and oil to a cooking pot. Bring to a boil, add the rice bag, return to boil. Turn off the stove, cover tightly and let sit for 15 minutes. In cooler weather or at altitude insulate the pot with a pot cozy. Stir the rice, top with the walnuts. Bring the water to a boil, set aside. Place the freezer bag in a cozy, add the oil and chicken, with any broth and the water. Stir well, seal and let sit for 15 minutes. 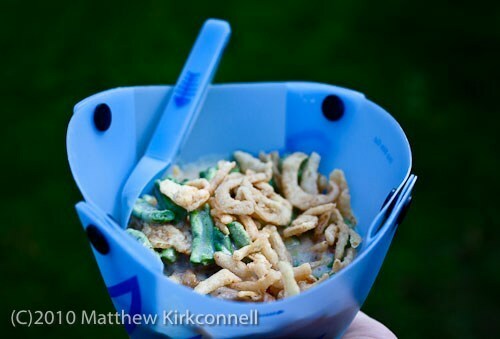 To make a second ‘bowl’ bring along a second freezer bag, cuff in half. Divide the rice and top with the walnuts. 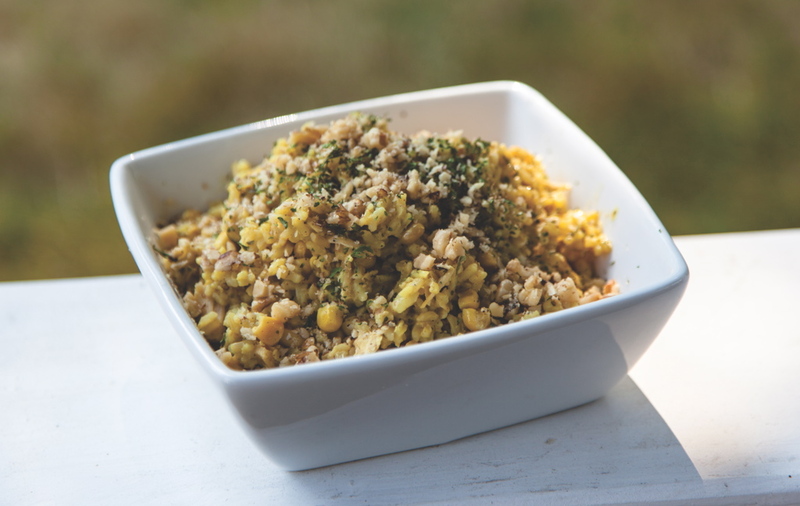 This recipe can be adapted to vegan by leaving the chicken out and adding in chickpeas if desired, or more nuts. Use the same amount of water called for, if using dehydrated chickpeas, hydrate them separately add, drained, with the hot water to the dry rice. 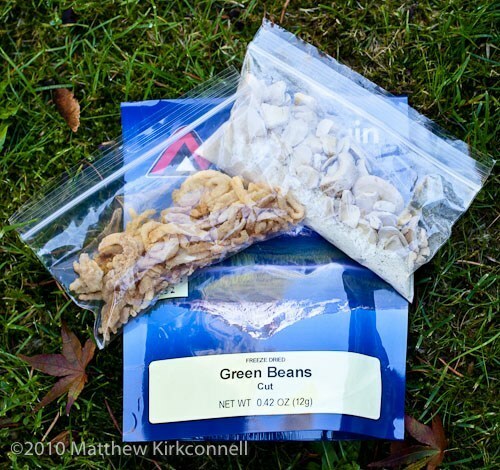 Pack the ingredients in a snack bag or pint freezer bag, depending on cooking method. Add the ingredients to an insulated mug or small bowl, cover with ¼ cup of water. Cover and let hydrate for 20 to 30 minutes. If a bit dry, add in a little more water as needed. Bring ¼ cup water to a boil, set aside. Place the freezer bag in a cozy, add the water and seal bag. Let hydrate for 20 to 30 minutes. If a bit dry, add in a little more water as needed. Pack the pudding ingredients in a sandwich bag. Tuck the butter in a small bag. Add the mix and 2 cups cold water to a cooking pot. Using a small whisk, stir while bringing to boil, over a lower flame. When the pudding comes to a boil and is thick, take off the stove and whisk in the butter. Serve warm or let cool, a cold stream or snow bank works well for chilling. Divide between mugs or bowls – or in a pinch served in pint freezer bags. 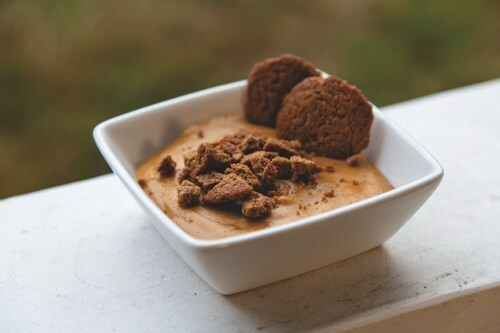 Crumble up some of the gingersnaps, dust on top, serve with the rest to dip in the pudding. Serves 2 to 4, depending on appetite. Dried pumpkin? Very easy! Spread a can of organic pumpkin purée on a parchment paper lined baking sheet, dehydrate in your oven at lowest temp till bone dry, then powder. Store tightly sealed. Or see here on how to do it in a dehydrator. Want it even better? Add in some rum at the end, after it comes off the stove.